Let it never be said I am southbound. I venture to places few would risk, the latest being Newcastle upon Tyne. There is a restaurant called 21 Queen Street. It's set among large Victorian buildings which tower upwards, dwarfing the narrow roadway. Looming behind them is the vast iron bridge across the river and, on the other side of the buildings, the quay and sluggish water. 21 Queen Street has a Michelin star and a Ronay star with an arrow, meaning it's top of their one-star choices. As nowhere else in Newcastle even has a rosette for horse jumping. I tried it. It"s unusually simple for somewhere north of St Albans. No offering of six different wallpapers, no nine wall lights. It's a grey room with a green dotted carpet and light- wood padded chairs. It could be an executive lounge at an airport. The clientele were dressed in clothes I haven't seen since the second world war. One man had a Fair Isle sweater festooned around his large top, others had odd suits. In front of me sat eight businessmen, three of whom were Japanese and smoked. 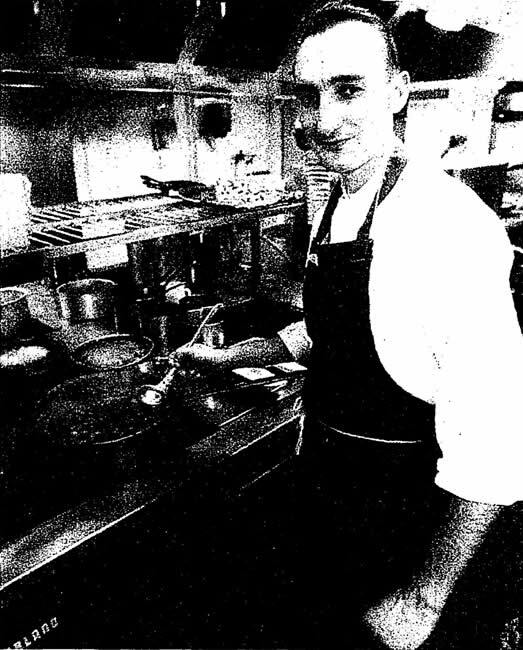 A booklet they give you has a photo of the chef and says: "Terence Laybourn is a Geordie with a wanderlust." On the night I went he’d wandered to some part of Europe. So things were in the hands of Steven Dray, whom the maitre d' told me came from Stepney. The food itself was varied. The amusegueule, there's a madly pompous phrase if ever there was one, was a bit of asparagus soup (nice) and a salmon mousse thing on toast (revolting) which could have been an airplane canape. My main course was excellent. Langoustine served out of the shell with black pudding and garlic mash. Before that there'd been a little drama. "No bread roll," said Mrs Lagoudakos. She comes from the Wirral and likes things just so. For dessert I had a mango tart with this and that, which was like school pudding. Heavy toffee on the bottom, not subtle. I asked to meet Mr Dray, the chef of the night. The maitre d' told me he was very shy. People from Stepney have many qualities, shyness is seldom one of them and it certainly wasn’t high on Steven's agenda. He was extremely nice and spent a great deal of time instructing me to say he came from Kent. "My mum'll be upset if you don't." he pleaded. "I'm not mad about Kent," I said. "Full of junior yuppies in three-year-old Jaguars." Steven had worked at Kensington Place and hated it. "Too much like a cafeteria conveyor belt," he opined. Quite right he was, too. His final, shy remark, as he saw my falling-to-bits footwear, was: "Next time you're out for a meal, Mr Winner, get yourself a pair of shoes instead." H A Mustard wrote some time ago to this very page saying how nauseating it was when I revealed how much I paid for things. So to brighten his/her day I will tell you what a recent meal for four cost me at Marco Pierre White's The Restaurant. One thousand eight hundred and twenty-eight pounds. If you want to read that again, please do. My friend Marco was with us when I got the bill, I didn't look at it and when told there was no service charge said. "Add 15%". The tip was £238! Prior to that Marco had been telling me endlessly that he never charged service on the wine, which on my bill was £1,210! "Marco," I said the next day, "you sat with your lips well zipped up when you heard me put a 15% tip on the wine!" "Did you enjoy the meal?" asked Marco. "Absolutely," I replied. "You're rich. Don't complain," he said. For weeks I bombarded him with my opinion of his charging £181.50 tip on the wine alone. Eventually he said, on the phone, "I suppose you're bad-mouthing me all over town about this?" "Totally correct," I said. "Send £200 to Michael Winner's Police charity," Marco bawled to a nearby employee. "There," he said. And then after a pause, "I suppose you'll still bad-mouth me about it anyway." "Of course I will," I replied cheerfully. He keeps asking me to review his restaurant, does Marco. I keep going there and forget to. It's extremely good. One day I'll get round to telling you why. But in the meantime, think of the wine when you add the gratuity. I protest! Your so-called "critic" wrote a mean-spirited attack on Tamarind, an Indian restaurant. The article was so unpleasant that I decided to try it. I found the following: The service is exceptionally good. The waitress named Robin is one of the world's best. The food was the best Indian cuisine I have ever eaten outside India. The ambience was equal to many of the finest restaurants in India. This is my definition of a great restaurant. I intend to go back and will recommend it to all my friends. I am sorry that your critic has inflicted such harm on a business through no fault of its own. It would appear (as I have just experienced), that Mr Winner has broadened his horizons to become a restaurant personnel consultant. May I just advise him that influencing people's decisions as to who is employed in restaurants that he frequents does affect the lives of those concerned. Perhaps Mr Winner and those who listen to him should consider this more carefully. But of course I am more than honoured to be a pawn in the great chess game of reviewers, film stars and restaurateurs. Eccentric people such as Mr Winner have certain entertainment value, but I feel he is overstepping the line by making a living from rudeness, arrogance, snobbery and slobbery. Do we really want to know that he keeps spare socks and ties in "all" his cars because he doesn't wear them all the time, needs to steal napkins from Claridge's to clean his Bentley's windows and apparently is in the habit of taking things from coffee shops without paying, no doubt trading on his name and position? I am only grateful he is not a 17-year-old product of modern education and values. Thank you Michael Winner for making my weekend! I have at last read of a restaurant of which you seem to approve, Zamoyski in Hampstead. Week after week I wait for a favourable review, but nearly always in vain. What I wonder are the chances of there being two "Winner approved" restaurants in a row? I am surprised that Michael Winner does not consult the two bibles of the restaurant trade, The Good Food Guide and Egon Ronay's Hotels & Restaurants Guide. For it is here, not in Exchange & Mart or Feathered World, that he will find Tessa Bramley's The Old Vicarage listed as one of the top restaurants in the country, ranking higher than Simply Nico, Greenhouse and Cafe dell'Ugo. Mr Winner also suggests that The Old Vicarage deserves better PR. Since the publication of Tessa's collection of recipes, The Instinctive Cook, just a week ago by Merehurst Fairfax, her restaurant has appeared in The Sunday Telegraph, on Yorkshire Television and now, thanks to Michael, in The Sunday Times.